SunLine Transit Agency’s Haul Pass Program is scheduled to launch this fall at participating colleges and universities. Transportation is often a barrier for Coachella Valley residents seeking education and employment opportunities. As such, SunLine Transit Agency recognizes that transportation options and economic burdens play a significant role in a student’s ability to successfully enroll and obtain a college degree. With the help of a recently obtained grant from California’s Low Carbon Transit Operations Program, SunLine is hoping to improve students’ access to the valley’s colleges and universities. The Haul Pass, a three-year program, will provide college students an expanded mobility option by allowing them to have free unlimited access to the public transit network. SunLine hopes to see an increase in its ridership numbers, thereby helping local colleges and universities reduce their carbon footprint. The Haul Pass program is scheduled to kick off on the first day of fall semester, August 27, 2018, for College of the Desert students, the first school to become a partner in the program. To be eligible, students must be enrolled at College of the Desert. 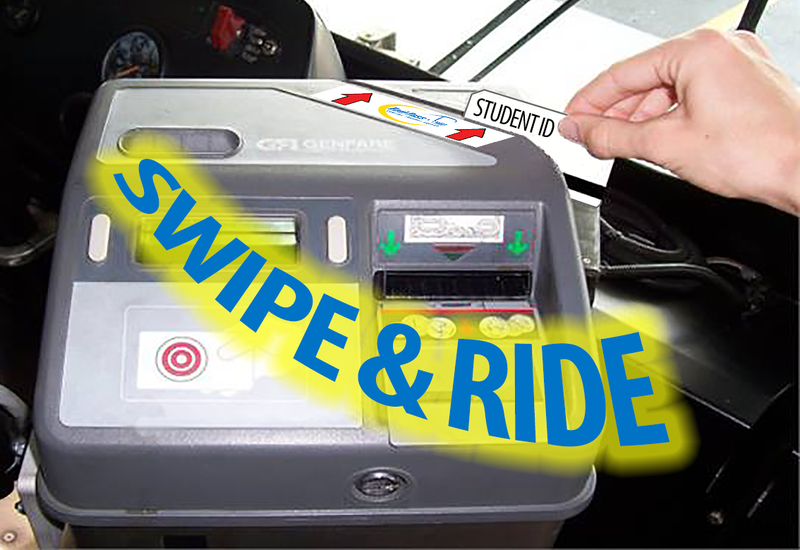 Students will use their active student ID card by swiping them through the SunBus card reader on the fare box. Should they require assistance, bus operators can help. It's as easy as SWIPE & RIDE. In addition to transportation to and from College of the Desert, the Haul Pass program allows students to use their active student ID cards to make unlimited local fixed route transit trips, including transfers, any day of the week on the SunBus. The Haul Pass program excludes SunDial paratransit service and the Commuter Link 220. SunLine can assist with trip planning over the phone, online or in person with free group training and one-on-one travel training for anyone who is new to transit or needs assistance. Colleges and universities that are interested in offering this program at their school are encouraged to contact SunLine.